We can supply strong, tubular cardboard bins to hold our sacks at £10.00 each. Being a tube makes them easy to empty, just lift the tube up leaving the sack sitting on the floor. 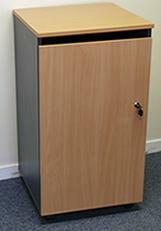 These attractive and secure locking cabinets are ideal for confidential waste storage. They are just under a meter high and can be supplied with or without wheels. The console is 50 cm square and 90 cm high. Green plastic deskside boxes at £1.50 each. Can recycling bins at £5 each. Although labled as aluminium, because we sort the cans back at our depot you can use the bin for any metal cans. Click here to go back to what you were looking at.